Track and log emails from your inbox with the HubSpot Sales Office 365 add-in. Tracked email: tracking an email gives you insight into how the recipient interacts with the email. You'll be notified when the contact opens the email via a pop-up notification on your desktop if you have the HubSpot Sales for Windows tray app installed, or if you are using Chrome with the HubSpot Sales Chrome extension installed. Paid Sales Hub users will be notified when the recipient clicks a link in the email as well. This information will be stored in your HubSpot activity feed or in your Windows tray app if you're using the Outlook desktop add-in. Emails that are tracked, but not logged, do not get recorded on a contact timeline in HubSpot. Logged email: a logged email is recorded on the recipient's contact timeline in HubSpot. That way, you can keep a record of your email communication with a prospect in HubSpot to help you understand where they are in your sales funnel. You can also use this history of logged emails to keep track of past relations and make sure you're communicating regularly with your most promising leads. Logged emails are for recording your interactions with the contact and do not give you insight into open or click information. This article covers tracking emails and logging emails with the HubSpot Sales Office 365 add-in. If you are using the Outlook desktop add-in, learn how to track and log emails with the Outlook desktop add-in in this guide: Track and log emails with the Outlook desktop add-in. In the message window, click Sales Tools. In the panel on the right, select the Track email opens checkbox (Sales Hub Starter, Professional, and Enterprise users will see Track email opens and clicks). Keep the HubSpot Sales panel open in your inbox, then click Send. Please note: real-time notifications are only available if you use the HubSpot Sales Office 365 add-in in conjunction with the HubSpot Sales Chrome extension or HubSpot Sales for Windows tray app (Windows only). If not, you'll only see activity in your HubSpot activity feed. 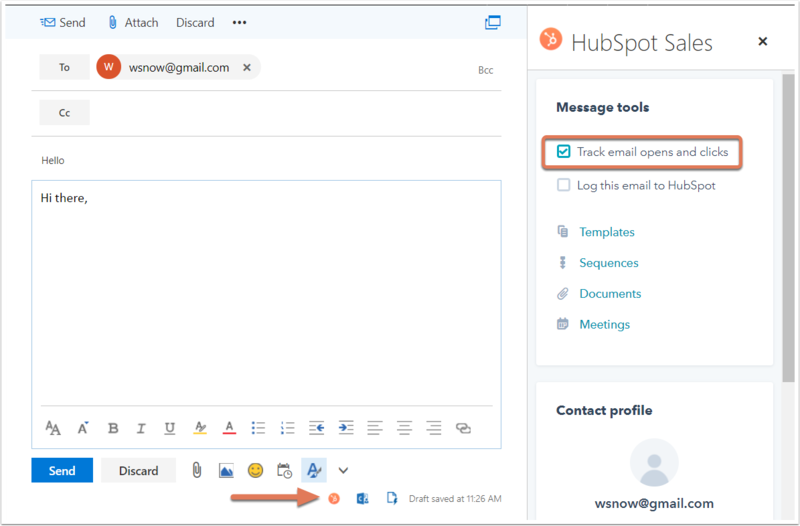 At the bottom right corner of your email composition window, click the HubSpot sprocket icon sprocket. 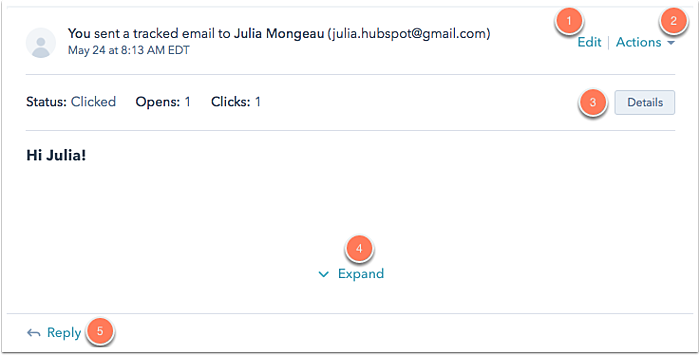 Keep the HubSpot Sales panel open with the checkbox selected, then click Send. You can also see how your contacts are engaging with your tracked emails from the Chrome extension or from the Windows tray app. To access your activity feed from the Chrome extension, click the HubSpot sprocket icon sprocket in the upper-right corner of your Chrome browser. Once the recipient opens the email, you'll receive a real-time pop-up notification on your desktop. When you navigate back to your activity feed, you'll see the email information marked as Open. Click the Show all activities dropdown menu below the contact's name to see when the recipient opened your email and where they were located. You will also see a history of the contact's activities listed in the dropdown menu. Learn more about how email tracking and sales notifications work. In the message ribbon, click Sales Tools. In panel on the right, select the Log this email to HubSpot checkbox. Your BCC address will auto-populate in the BCC field. Please note: you must keep the panel open in order for the email to successfully log to HubSpot. In the bottom right corner of your email composition window, click the HubSpot sprocket icon sprocket. In the panel on the right, select the Log this email to HubSpot checkbox. Your BCC address will auto-populate in the BCC field. 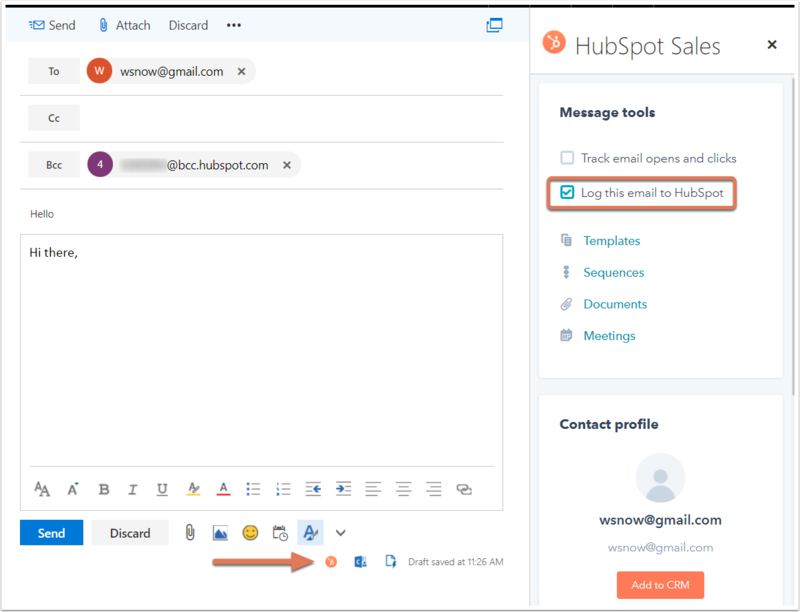 Email that are logged to HubSpot using the Office 365 add-in will automatically be associated to the recipient's contact record, its associated company record, and the five most recent open deal records associated to the contact.